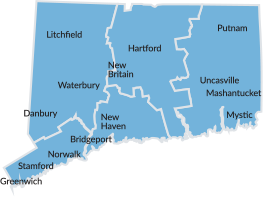 Connecticut is located in the northeastern United States and is a great place to enjoy all year round. Use our Season Selector menu to view experiences in any season. And here is some information about Connecticut’s climate, and what to expect when planning your visit. 4.04 in. / 10.26 cm. Spring in Connecticut is unpredictable. There is often snow or frost on the ground into March, but when the spring warmth does arrive, you’ll want to pack clothes that are good for layering; light jacket, sweaters, t-shirts and a pair of sneakers. 3.83 in. / 9.72 cm. Expect warm temperatures and mostly sunny days. Pack warm-weather clothes such as tank tops, shorts, dresses and flip flops or sneakers for outdoor activities. Could also pack a light jacket for cool nights. And don’t forget sunscreen! The fall brings clear days perfect for viewing the gorgeous changing foliage. But the sun goes down sooner and temperatures follow. Pack clothes that can be layered and are good for outdoor activities: sweaters, light jackets, jeans, sweatshirts and sneakers. 25.6 in. / 65.02 cm. Expect cold temperatures throughout the day, with possibilities of snow, which could get deep at times. Pack warm clothes, sweaters, heavy jackets, scarves, gloves and boots or snow boots.